Progress in molecular technology in recent years has caused an amazing growth of information about intercellular peptide messengers and their receptors. The number of characterized interleukins for example numbered just three six years ago and now there are at least 16. In addition, the number of described neutrophic peptides is around 30 and the number of receptors is ever increasing. Because many of these new peptide ligands and receptors were identified by "reverse genetic" techniques the understanding of their biological roles falls behind the knowledge of their molecular structures. However a new strain of functional studies has begun and animal models are developed allowing for further research into the biological roles of these messenger peptides and their receptors. 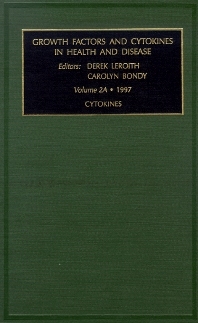 Cytokines, the theme of this volume, describes a group of proteins identified primarily within the immune and hematopoietic systems. As many cytokines as possible are included along with their receptors providing the reader with a guide to an ever-changing field of scientific research. Contents. List of Contributors. Preface (D. LeRoith and C. Bondy). Interleukin-2 (M.T. Lotze). Interleukin-3 (J.W. Schrader). Interleukin-4 (J. Banchereau and S. Saeland). Interleukin-5 (K. Takatsu, R.R. Dickason, and D.P. Huston). Interleukin-6 (C. Lai and H. Baumann). The Role of Interleukin-7 (IL-7) in the Generation and Regulation of Immune Responses (D.H. Lynch). The Biological, Biochemical, and Molecular Profile of Leukocyte Chemotactic and Activating Cytokine, Interleukin-8 (A. Harada, M. Mukaida, and K. Matsushima). Interleukin-10 (A.H. Enk). The Interleukin-2 Receptor (M.A. Goldsmith and W. C. Greene).